Over the past few years, a budding tech industry has taken off in Los Angeles. Many companies have flocked to the “Silicon Beach,” along with them came hungry job-seekers. 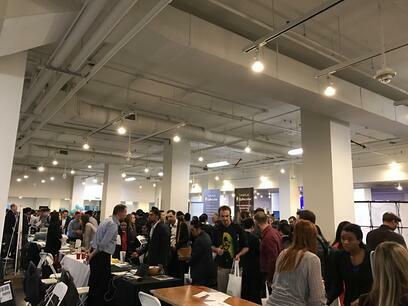 Last week, Convoso headed to TechFair LA to network with 11,000+ talented attendees searching for opportunity and more than 200 other top Los Angeles-area tech companies. 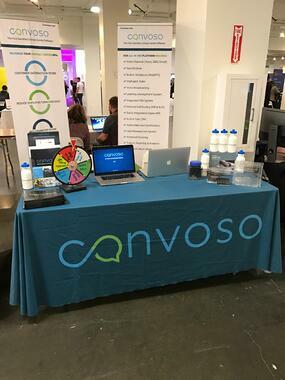 At Tech Fair, Team Convoso had a great time making new connections, and of course, putting our signature game-twist on the event! Convoso collected hundreds of resumes and talked with many wonderful prospects… we even ran out of all of our business cards! Booth visitors won Convoso swag prizes, and one grand prize winner walked away with a pair of Samsung Virtual Reality Glasses (Congrats Buck!). The event, hosted by LA Mayor Eric Garcetti and Entrepreneur in Residence Jason Nazar, boasted a mix of 200+ tech giants and small startups, with companies such as AirBnb, Snapchat, Uber, and more. Amongst some of the most innovative and companies to watch: Skert, Space X, and Sooth. Overall, an incredible event, and Team Convoso is already looking forward for next year!